Early last Wednesday morning before light, Knox and I left the warmth of our beds and drove toward town. It was raining and cool, not quite cold, but very wet. We drove through Toccoa, not meeting much traffic. People were just getting up and ready for the day. We were heading for Currahee Mountain. As mountains go, Currahee is not too tall. It's name is a Cherokee name meaning "stands alone". It is on the southern most end of the Appalachian Mountains and truly stands alone as the Georgia Piedmont rolling, flat hills back up to it. As we approached Currahee, the peak couldn't be seen. There was a halo of fog and rain that encircled the infamous peak. But we were undaunted. We were on our way to see the special event that was about to take place on that mountain. 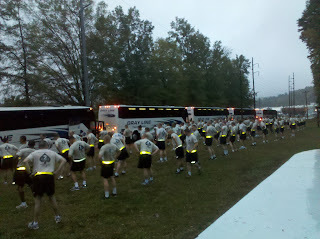 750 men and women standing outside 18 charter buses warming up and getting ready to run a mountain that had trained 20,000 men during WWII! This was something that had not been seen for almost 70 years! These men and women had just returned from Afghanistan. They came to pay tribute to the men that had started their regiment. The men that had ran Currahee Mountain every day, twice or sometimes three times a day as they prepared for the invasion of France. It was a solemn tribute. This is not a paved road. (Click here to see a video that shows the drive up the mountain.) The night before we had had over 1" of rain. It was still raining. That meant that it was going to wet and muddy--bad muddy! and headed up the mountain. We all had lumps in our throats. It was this cry that so many had yelled as they went into battle never to cry again. It was this cry that these men and women yelled as they paid tribute to not only the ones that had run on this red, muddy, dirt road years before, but for the ones that would never be able to run this road again. As the light filtered through the clouds, we watched as more of the 506th marched in their formations up the red mud road. Then we saw a group coming down! It was the first group that had left. I got out my video camera and started filming. It's what you hear in the video that tells you about scrifice. Listen closely...over the marching chats, you will hear the sloshing of shoes and mud. We unfornately had to leave before they all came down off the mountain. As we left for school, I asked Knox if he was glad we came. He looked at me and said, "We got to see history today, didn't we?" I said, "Yes we did!" I haven't been able to get those pictures out of my mind. They are pictures that bring home the fact that there are others in this world who are placing themselves in harms way for me and my family to be able to watch history happen. It is the footsteps of these men and women that I want to see time and time again climbing this and other mountains to keep my family and myself free! If you would like a little more history on Camp Toccoa, click here for another article I wrote about the men who trained here. I also recommend watching the HBO mini-series Band of Brothers. But remember that none of the footage you see of the men running Currahee was filmed on Currahee Mountain!